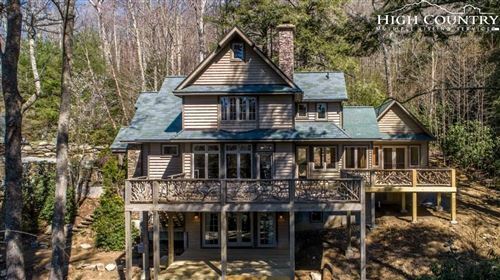 Magnificent timber frame home found within the gated community of Chestnut Hill, located only minutes from downtown Banner Elk. Tucked among trees and rhododendron, this custom-designed home provides privacy and natural beauty both inside and outside, where you can enjoy the lighted old logging trails, cook out or build a fire in either the lower or upper fire pit, relax in the Jacuzzi, or just sit on one of the several open/covered decks. The basement level houses a deep double garage, office, and den with a fine reproduction English pub bar. The front door opens to the beautifully appointed main floor, where the massive pegged Douglas Fir timber frame soars thirty feet above the living room. The gourmet kitchen, dining areas, master suite, and soaring stone fireplace complete this gracious entertainment level. Three stone gas fireplaces create warmth and ambiance. Newly built in 2006 and meticulously maintained, this home is being offered by the original owner. This breathtaking home is the perfect vacation retreat for holidays and year-round enjoyment of the many High Country attractions. Start creating your memories in this one-of-a-kind luxury home.